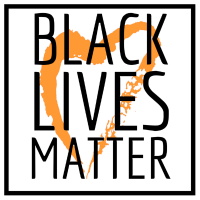 First Unitarian Universalist Society of Syracuse (First UU) offers a variety of handicap accessible accommodations for hosting your event. Large or small, we have a rental space to fit your needs and that’s within your budget! Our spaces are rented in 4 hour increments. Current rates are available by calling the Society Secretary at (315) 446-5940. In addition, a variety of businesses and restaurants are convenient to our location. 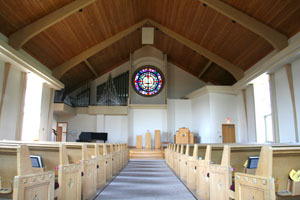 The Sanctuary is a large bright, and inviting space graced by a beautiful stained glass window. A perfect setting for weddings, lectures, and concerts. The Narthex is a picturesque space complete with a soaring ceiling and a wall of windows overlooking the courtyard and gardens. The Parlor is an ideal space for workshops, support groups, and luncheons. Comfortable lounge seating along with a fireplace. A kitchenette is included for preparing and serving refreshments. 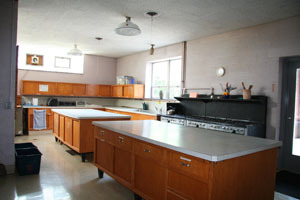 The Kitchen is a full service kitchen available for preparing meals or simply coffee and snacks. Fellowship Hall is a large space available with tables and seating configurations for any party size. 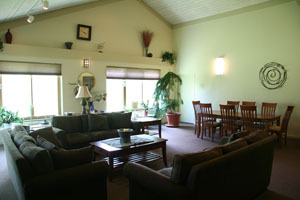 The Community Room can accommodate medium to large groups and may be configured in a variety of ways to meet your needs. The Youth Community Room space is well suited for small groups used in conjunction with a larger space. Please fill out the rental request form below and someone will contact you shortly. What area would you like to rent? Check all that apply. How many hours will you need to rent this area? What is the purpose of the rental? Please describe the event to help us understand your needs better.